Here’s the scenario: You come home from the grocery store. Overflowing bags cover the counter. As you empty each bag, you find it hard to fit fresh produce in your refrigerator full of leftovers and condiments. The freezer is stocked with meat on the edge of freezer burn, along with bags of fruit and vegetables. 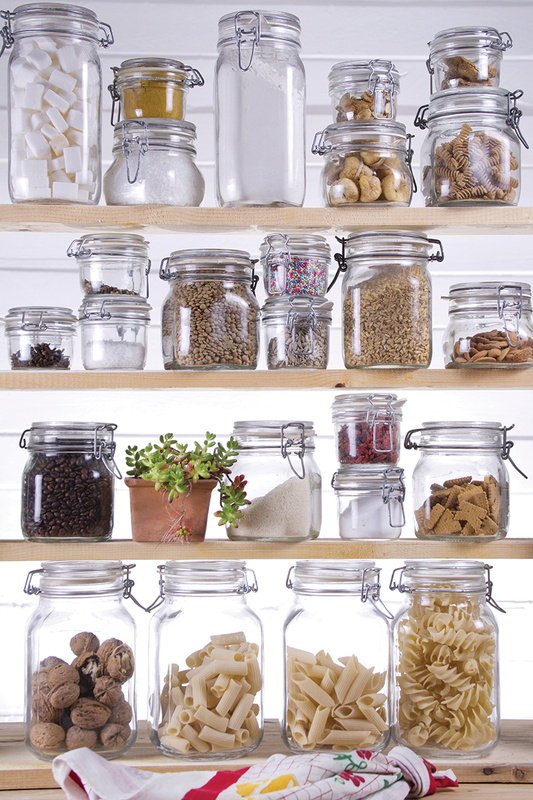 Your cupboards are filled with containers of grains, pasta, dried fruit, and cans of various vegetables, legumes, and sauces. Why is it that we do such a good job of stocking our pantries full, but then just continue to purchase more food? With a little organization, planning, and foresight, you can utilize your provisions effectively while saving money. The first step is taking inventory. Go through your fridge, freezer, and cupboards, and take note of what’s there. Make this list accessible and keep it current (see sidebar for pantry-organizing apps and websites). As you review your supplies, dispose of items that are out of date and make a donation pile of unopened cans and dry goods you know you won’t use. Next, start meal planning. Note the recipes you cook often and focus on the staple meals that use your existing pantry items. Find new recipes that use what you already have in stock. Then, formulate your weekly, or even monthly, menu, making sure to incorporate “unstocking Sunday,” “leftover Wednesday,” or “no-leftovers Friday” into your plan. Stick to your shopping list! Avoid buying food you already have by double-checking your inventory before you shop. And always think twice before buying new items. Can you make do with what you have? Or go big and avoid shopping altogether with a grocery sabbatical. This forces you to cook meals with only the ingredients on hand. See how long you can go. (Once, I went on sabbatical for two weeks—in the middle of summer with garden produce, mind you—but ended up knocking on a neighbor’s door for salt.) This method is good for getting rid of everything—a kitchen cleanse, if you will—but doesn’t necessarily build good menu-planning habits. 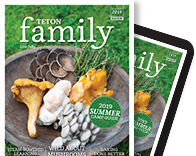 Implement even a few of these suggestions to pave your way toward the money-saving habit of clearing seasonal clutter. By taking inventory, planning meals, and managing your shopping, you will ensure that this summer’s stock won’t become winter’s garbage. Meat: Slightly freezer-burned meat can still be used. Turn it into stock or make meatloaf or meatballs by “mostly thawing” it, grinding it up in the food processor, and mixing in a little fat (bacon, sausage, or ask the butcher for fatback). Vegetables: Remnants of frozen vegetables can be added to soups, stews, omelets, frittatas, pilafs, risottos, pastas, pizzas, or empanadas. Fruit: Frozen fruit never goes unused. Think smoothies! Or add thawed frozen fruit to yogurt or oatmeal. Make compote for pancakes or bake quick breads, muffins, cakes, pies, galettes, cobblers, or crisps … you get the point. Beans: Always use dried beans before canned; save the canned for last-minute meals. If dried beans are older than a year, they may never soften, so toss them. Cook a pot of dry beans to use throughout the week in soup, or to make burritos and dips. Pasta: Casseroles, lasagnas, and baked pasta dishes were traditionally intended to use up everything in your refrigerator, freezer, and cupboard. So go for it! Grains: Change things up by making risotto with quinoa or barley, or throw together a pilaf with farro or bulgur. Canned Sauces (enchilada, curry, etc. ): Design easy weeknight dinners around all your sauces that are collecting dust. Dried Fruit and Nuts: Toss a bag into your lunch box, make a trail mix or granola, or add to salads, pilafs, muffins, or quick breads. Condiments: Do you often buy condiments for one recipe and then they just sit there, taking up space? Find ways to use them, offer them to friends, or toss ’em. Search recipes by the ingredients you have on hand. This site gives you the option to add or exclude up to four ingredients. Build a virtual pantry list by checking off items that you have on hand. Then, view recipes that include these items, or highlight certain ingredients for more specific results. 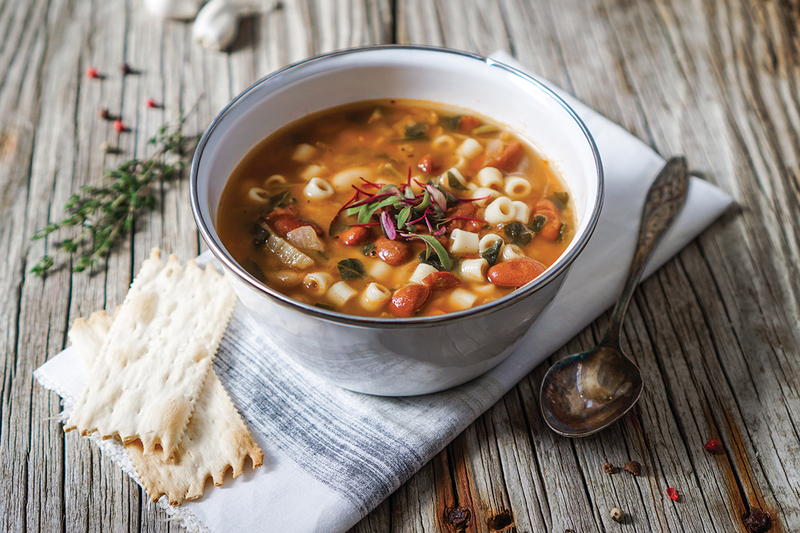 Because minestrone has no set rules, it’s the perfect way to use up bits from your refrigerator, freezer, and cupboards. This “recipe” is meant as a guide. Most ingredients are optional. 1. Heat oil in a large saucepan. Add meat and cook until brown. Drain all but 1 1/2 tablespoons of oil and fat. 2. Add carrots, celery, and onions and saute until soft, about 5 minutes. 3. Add garlic and saute 1 minute. 4. Add tomato paste and cook 1 additional minute. 5. Add stock or water, tomatoes, greens, vegetables, potatoes, red pepper flakes, herbs, and Parmesan rind. Bring to a boil, and then reduce heat and simmer for 30 minutes. 6. Add cooked beans and simmer for 15 minutes. 9. Serve as is or over pasta, if desired.